Revit keynotes as they should be. Keynotes should be simple. We made it happen. Don't let using keynotes slow you down. Zero setup or training time. Single click edits. No external apps or files to manage. Keynote editing and placement at your fingertips. Integrated into the Revit window for a workflow that won't slow you down. Setup existing projects with a single click. Share projects with non-STIKeyNotes users without any modifcations. See each revision for any keynote. View word-by-word modifications. Restore a previous keynote version. Single-click upgrade for any existing model using the standard keynote file. Converted in seconds to STIKeyNotes. Keynote legends are automatically created, filled, and placed on each sheet (can be disabled in settings). 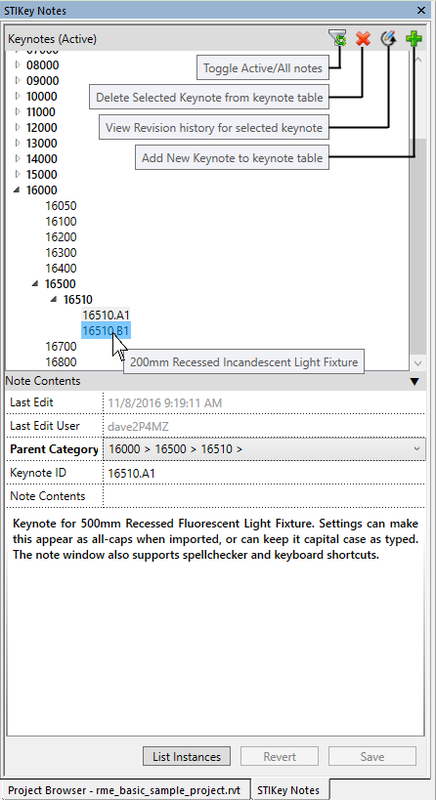 Using keynotes in Revit doesn't have to slow you down, or require complicated tools. STIKeyNotes is deisgned to get you and your colleagues past managing text files and external applications and back to designing in an instant. Save hours of valuable production time with a solution that simply works (and is hopefully quite intuitive). No more editing text files. No more external applications. All of the keynotes used (or even removed!) are available within the revit window. Want a new keynote, just click add. Want to edit a keynote? Click it and type away. Want to place a keynote? Double-click and place it. Unlike other keynote managers, there is no external file or application. And there is no longer a need to mess with the built-in Revit keynoting window. The days of typing a keynote, reloading your file, and trying to find that note in Revit are over! We all make mistakes. Now they're easily undone. With the STIKeyNotes revision history, you are able to see each edit in detail. 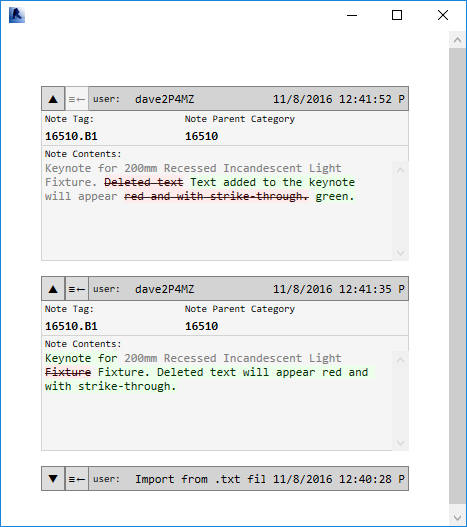 See what words or phrases were added or deleted, along with the user and timestamp for that revision. In addition to seeing each edit. If you need to restore a previous version, simply click the 'restore' button next to the edit and the live version in your model will reflect that edit. Run a report showing the live version of each keynote for a particular date and time. Useful for validating information in a model sent to a consultant or seeing if the edits made it in before a key deadline. Easily share models or keynote files. Not everyone has the same software or add-ins. Without any modification, a standard Revit installation can still use the built-in keynoting features as they normally would. Clients receiving the model or co-workers without STIKeyNotes add-in are able to perform all of their normal tasks without any additional work on either party's behalf. The STIKeyNotes database may also be exported to the standard Revit keynotes .txt file with a single click. Download now and see how easy keynoting can be. Currently in Open Beta. Software is open to all users, but is still in development. See how easy it is to get started. 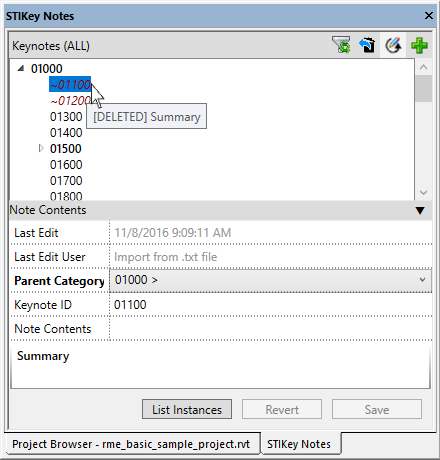 STIKeyNotes for Revit - Quick Demonstration. Getting started in 90 seconds. Note that a deactivated note may not be placed, and a note which has been placed may not be deactivated. I love the workflow! Having all of your notes two clicks away is amazing. Training on this should consist of a five minute demo and any user can be ready to go. This thing rocks. I wish this had been available for years. I've saved so much time in my first week. We will definitely be rolling this out to the rest of our users. The only part easier than using this is convincing the rest of our engineers to do the same. We couldn't be happier to be rid of the text files and formatting issues that were thought to be typical. A+ work. I particularly like seeing the Revisions History. That's awesome! © STIKeyNotes 2016 All right reserved.